Last Saturday, I finally got another Winter War game played. 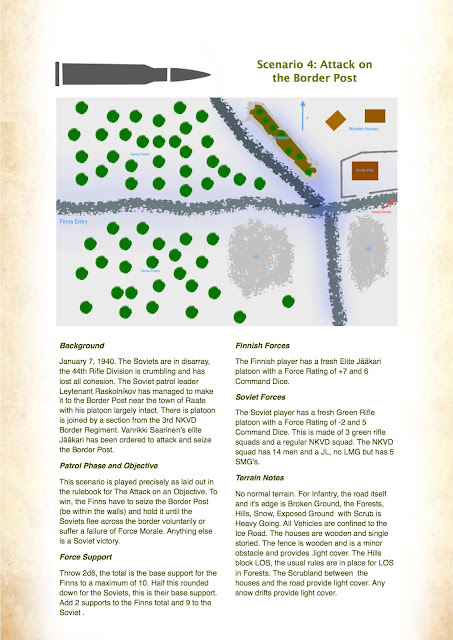 Readers of my blog will know that I had some difficulty with the structure of the campaign related to the perceived playability of the Soviets. According to the CoC army lists in January 1940 the Soviets should be rated as green with 4 Command Dice in the Finland. My opponent found this a boring game and I could only agree, after a lot of discussion on the TFL forum it was felt best to increase the CD to 5 while keeping the force green. By then however interest had faded and the campaign went on a hiatus. Fortunately for me, I met an experienced CoC player at Huzzah (he was actually demonstrating CoC for Eureka Miniatures, the new TFL representative in the US). Mike P was quite interested in playing and actually drove all the way from RI to Malden to have a game. I decided to go with the last scenario in the campaign, because I wanted to see my NKVD troops in action. The scenario is as below and is pretty straight forward. I gave the Finns two extra support choices as I had increased the Soviets CD to 5. This is all laid out in the CoCulator. I did not adjust for the NKVD being regular, as I had kept the tactical Finn supports as Eite. There is a bit of debate about this on the TFL forum. Well we had a great game, Mike is quite an engaging fellow and very pleasant opponent. The game was enormous fun, see-sawing back and forth, I thought I had it in the bag several times. Notwithstanding the Command Dice favouring me in mid game (I had 4-5 double and triple 6's), I eventually lost on morale failure. Mike played a great game digging in his Soviets and bringing out well chosen supports at the right time. Anyway on to some snaps. 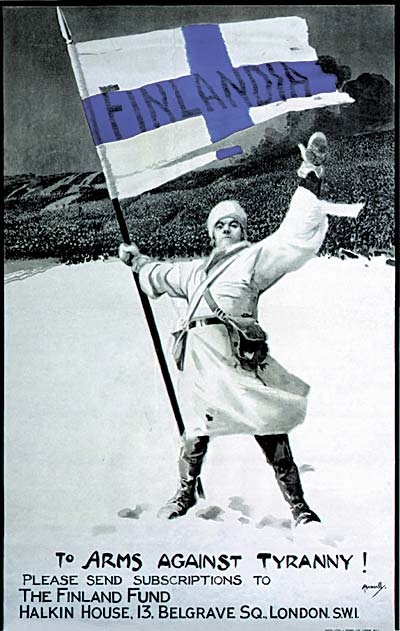 I have subsequently found out that the calculations in the Winter War army lists for Force Morale are wrong the Green Soviets with 4CD should be -4 and Finns are +5. Still a -9 difference though so no effect on the game. I forgot to take a picture of the Patrol phase but I thought it went well for me with JOP's in defendable positions well up the table. We diced for Morale, if I remember correctly the Finns (me) were 9 and the Soviets were 8. We are looking from the north here with the Border Station to the right in the photo. I bring on a SMG squad in the middle of the photo, to the left you can see a Soviet squad in entrenchments behind barbwire. 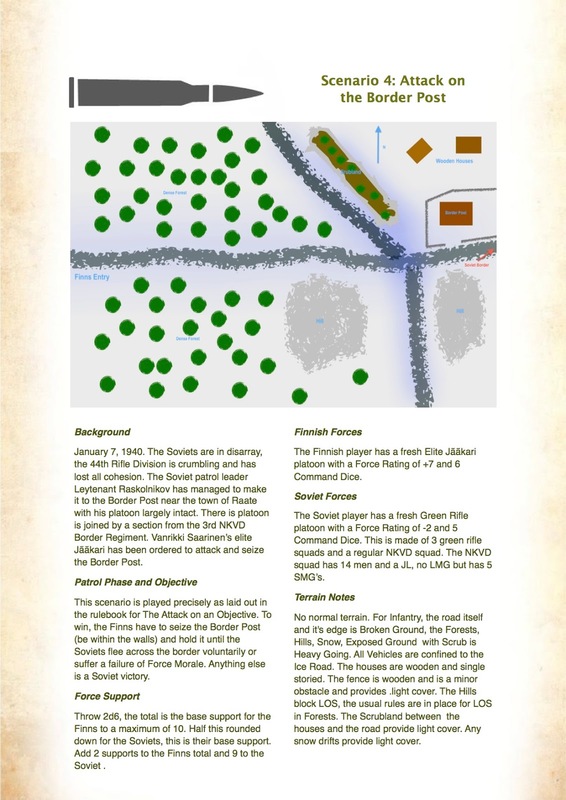 Mike took two entrenchments and barbwire as part of his support advantage. 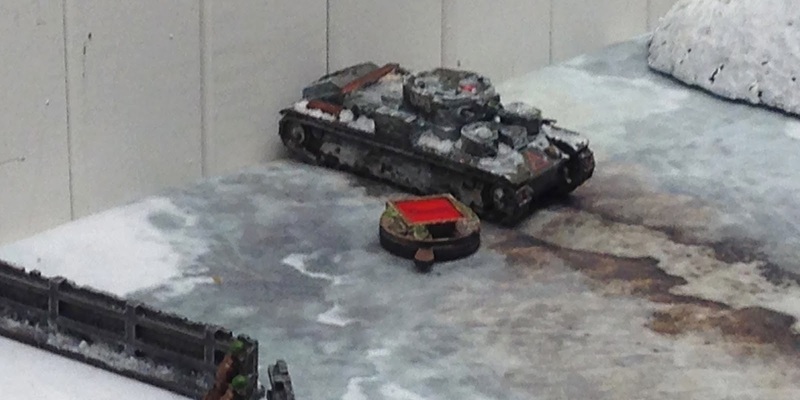 He also took a T28 which gave me no end of trouble. Here we are looking from the south, my LMG squad with a captured DP-28 are creeping around the Soviets left flank with the hill blocking LOS. This did not really work out for me, as I could do little with them. My supports had included a Maxim MG team, an AT gun with a JL as well as the captured DP-28. I was able to take out the Soviet squad eventually firing at them from 3 positions despite them being entrenched. Finnish Maxim MG Team. I have finally learned that you can not put support teams down unsupported by infantry, despite them both being elite and in cover they were quickly taken out by combined MMG and HE fire from the T28. Out of sequence here, the entrenched Soviet infantry squad. 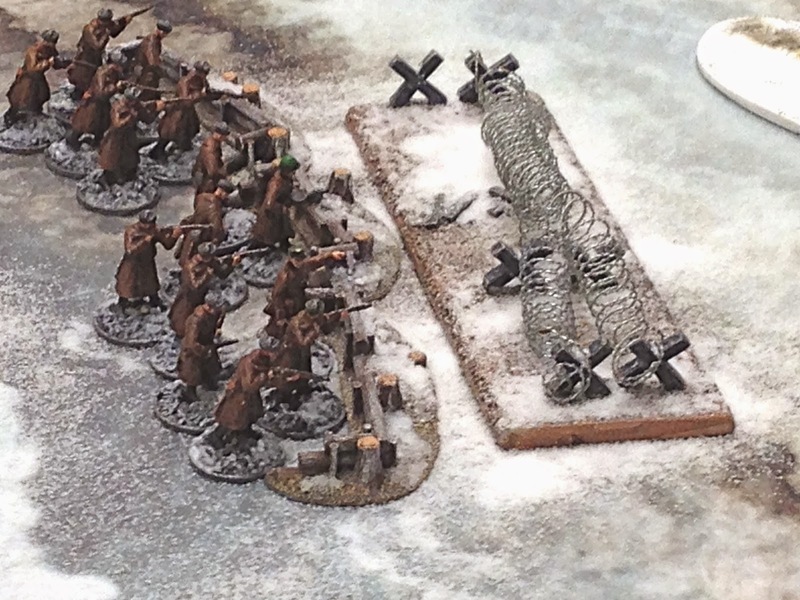 I use 15mm barbed wire and entrenchments from FOW, they seem to work well for 20mm. The terrain rules for the game worked well, simpler is always better! The T28, I think from SHQ. I scored one shock on it only despite hitting it 3 times with the AT gun. Mike cleverly used a MMG and the cannon each time he fired (6d6 each), the HE is of advantage when troops are in the woods. The Soviet 3rd squad in light cover behind the wooden fence surrounding the border station. I have never done this before but I forgot to bring the houses, so had to rely on some Dark Age cottages which were lying around at the Hobby Bunker. The NKVD arrive! Mike had also took a an NKVD medium mortar team that also gave me some trouble. I bring on a second SMG team to support the first squad which was now somewhat diminished. It was time to attack the Border Station. Maybe a little prematurely as it turned out. I had an excellent throw of 3 threes on my command dice. Time to declare Rynnäkköön, unfortunately one of the SMG squads was just out of range so I only could attack with the fresh squad. I did open up though with an LMG squad to the south and the lagging SMG, two kills and some shock resulted. Would it be enough. Combat is brutal in CoC, and unfortunately I lost the combat by 1 man. The 5 SMG's the NKVD squad made them formidable close order fighters. I was thrown back, both the NKVD and Finns were pinned. But by then both our FM's were down to 3. On the next Soviet turn, Mike was able to force a further morale test, no CoC Dice left, the Finns were down to 0. Well it was really a lot of fun and more importantly with some minor adjustments, it showed me that a Winter War campaign can give an entertaining game to both sides. But of course, the best thing is that I have met another local (relatively) CoC player. Great looking board and setup. I've always wanted to do a winter game but keep getting drawn back to the desert! Thanks, after some urban warfare the desert is my next destination. That is a good way to explain it Peter. Very atmospheric, I had to put my coat to read this great report John...thanks for sharing! Thanks Phil, it was quite warm, I had to put on a fan! Looks cold though. Looked like a good game the couple of times I was able to look in on it during my game with Mike. Thanks Adam, it was fun. Ooh, that game looks marvelous - well done! I love the Cigar Box mat. I just wish their shipping wasn't so ridiculous otherwise I wouldn't hesitate to pick up a couple. Thanks Curt, it is one of the better games I have had. The Battle of Waterloo 200 years today!